On the evening of Sunday 14th April 1912, the weather for the Atlantic was unusual because there was a calm, flat sea without wind or swell. In addition, it was a moonless night. Under normal conditions, waves would have broken over the base of an iceberg, helping people to see them even on such a dark night. The temperature had dropped to near freezing, creating difficulty for the lookouts. At 11:39pm, the two lookouts suddenly spotted a large iceberg up ahead that was towering about 20 metres above the water. They immediately sounded the warning bell and telephoned the bridge with the message "Iceberg - right ahead!" First Officer Murdoch, who was in charge at that point, ordered the ship to turn "hard-a-starboard" - the traditional order for a quick turn to port (left) and so away from the iceberg. The helmsman spun the ship's wheel as fast as it would go and the engines were stopped before going into reverse. 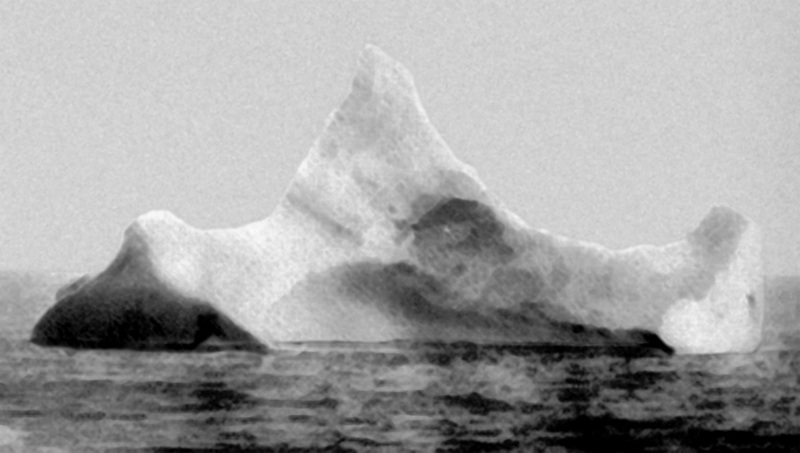 The Titanic did begin to turn but after only 37 seconds since being sighted, the iceberg still managed to strike its starboard bow (front-right), buckling the hull and letting seawater come into the ship. The impact, although jarring to the crew at the front, was not noticed by many of the passengers. At midnight, Captain Smith was told by Thomas Andrews (the ship's designer) that the ship was sinking. Although the watertight doors had been shut, too many of the compartments had been filled with water - the ship was now too heavy and it was predicted it would only stay afloat for two hours. The wireless operators were instructed to send out the "QCD" distress call. At 12:25am, the order was given to start loading the lifeboats with first-class women and children first. It took a further 20 minutes before the first of the lifeboats was safely lowered, and even then it was less than half full - carrying 28 instead of the maximum 65 people it was made for. 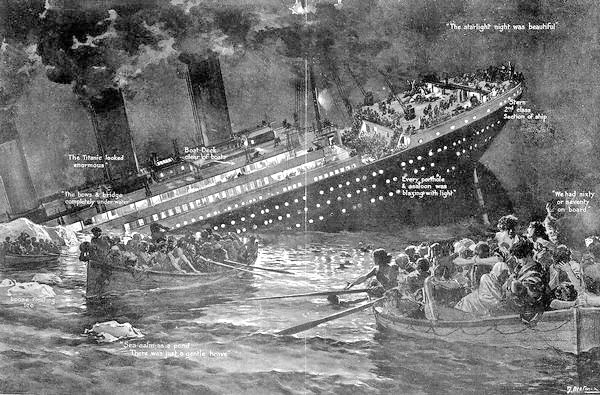 As the Titanic began to tilt more in the water, distress rockets were fired and the passengers started to move towards the stern (rear) of the ship. The ship's band continued playing on deck to keep everyone calm and upbeat. At 2:05am the last lifeboat left, with 1,500 people still on board the sinking ship. Captain Smith told the remaining crew members that "It's every man for himself" and returned to the bridge to await the end. Thomas Andrews was seen alone in the first-class smoking room staring into space. Father Thomas Byles heard confession and gave absolution to over 100 second and third-class passengers. At 2:18am the lights went out and the bow (front) of the ship plunged under the water. Many people jumped overboard as the ship broke into two. The broken off stern settled back into the water, becoming level for a few moments. Slowly it filled with water and again tilted its end high into the air, before finally sinking vertically into the sea at 2:20am. Many people were left struggling to swim in the icy water as those on the lifeboats feared that they would be swamped if any rescue was attempted.